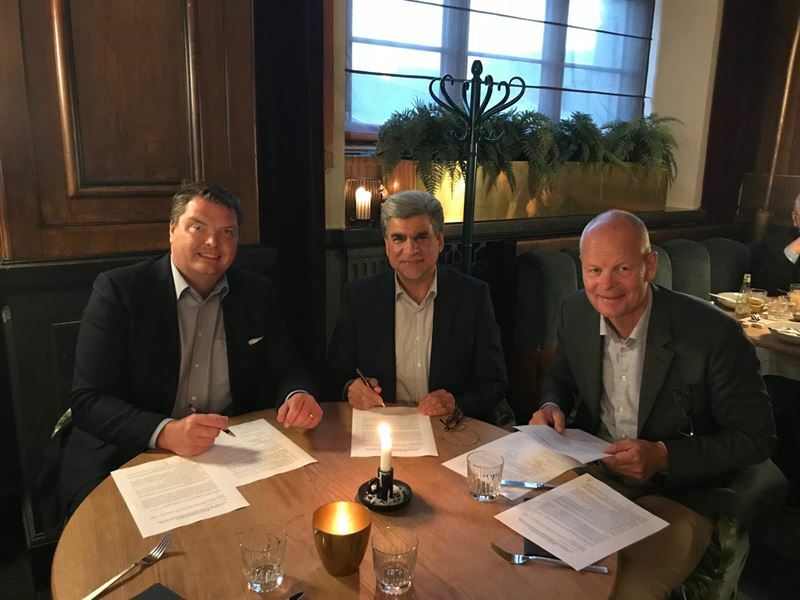 Scandinavian Enviro Systems (publ) (”Enviro”) has signed a HoA (Heads of Agreement) with the German company DHF Development to facilitate the establishment of one or more recycling plants in The Middle East together with Industrial Development and Renovation Organisation of Iran (IDRO). The agreement is valid for a period of three months. Thomas Sörensson, CEO Enviro, Reza Adelli, Managing Director of DHF Development and Stefan Tilk, Member of the Board Enviro. “We’re getting closer to a partnership in the Middle East with IDRO. The dialogue has been ongoing for a year regarding a recycling plant in Iran. IDRO has now also shown interest in establishing plants in the neighbouring region,” says Thomas Sörensson, Enviro CEO. The financial partner of IDRO (www.idro.ir), as well as the signatory part, is DHF Development (www.dhf-dev.com). The ambition is to facilitate the establishment of one or more plants in the Middle East. The HoA is a non-binding letter of intent to define collaborative forms and project details over the next three months. There is the possibility of extension if needed. Construction capacity will be defined during the three-month period, with a volume of 30,000 tonnes up to 60,000 tonnes of tyres per year. "Iran is a growing market for both vehicle- and tyre production, driven by the establishment of international companies in cooperation with local interests. This means that the need for a long-term and sustainable solution for the recovery of tyres and tyre materials increases,” says Thomas Sörensson. The delegation from Iran: Dr. Mansour Moazami, Chairman of IDRO & Deputy of Minister, Dr. Fardad Daliri, Senior Adviser IDRO, Dr. Ali Araqchi Director, General for International Affairs IDRO and S.M. Reza Adelli, Managing Director of DHF Development. This information is information that Scandinavian Enviro Systems AB (publ) is required to publish under the EU regulation on market abuse. The information is provided under the auspices of the contact person listed above for publication on July 6th 2018 at 10:50 CET.